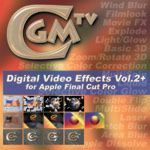 Description: "CGM DVE Vol.2+" is a set of 35 filters and transitions for use in Final Cut Pro 2 and 3. In addition to the professional plug-ins the package also includes a series of Final Cut Pro workshops and 67 "soft wipes." Apple paid the ultimate compliment to CGM-Filters Volume 1; it licensed the product for inclusion in Final Cut Pro 3. So, whenever you pull down your effects menu and see the subheading DVE Effects, you benefit from the addition of these amazing filters. 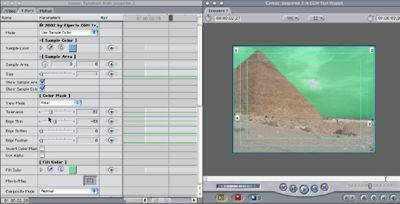 The CGM Volume 2 package is a collection of 13 transitions, 17 filter effects and 67 soft wipes. 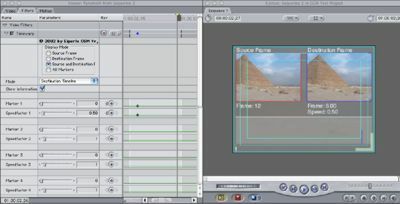 Additionally, 7 of those transitions also appear as filters, meaning that they have the added functionality of filters. Look for yourself at the transitions and filters which are included. 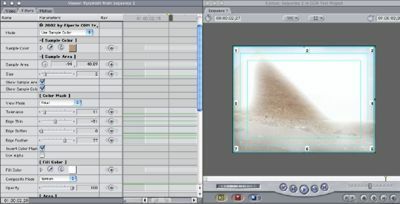 You will note some duplication between the transitions and filters. 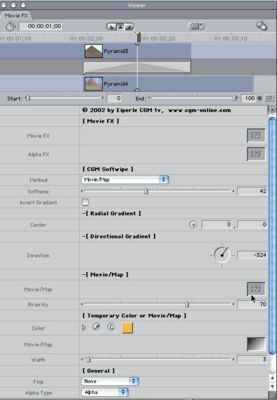 The following transitions may also be used as full-featured filters: explode, laser, liquid, multislide, multispin, pixelstorm, stretch blur. The more perceptive among you will note an aqua interface on these screen shots. Yes, CGM transitions and filters work in OS X. Here's why they work: The developer, producer and programmer Klaus Eiperle, emphasizes that these are "native" FCP plug-ins rather than After Effects plugs. There are several significant benefits to be realized from this architecture. First, the plug-ins are compatible with OS 9 and OS X. Next, they will render in YUV colorspace rather than RGB space, as do AE Plugs. As an aside, note that After Effects renders in RGB space. 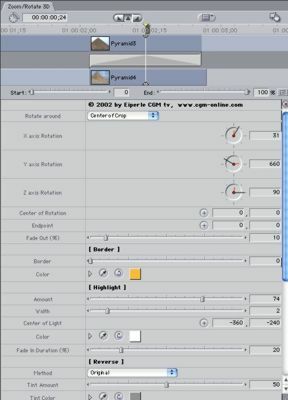 Many AE plug-ins, then, do not translate between RGB and YUV color space when rendering in FCP. 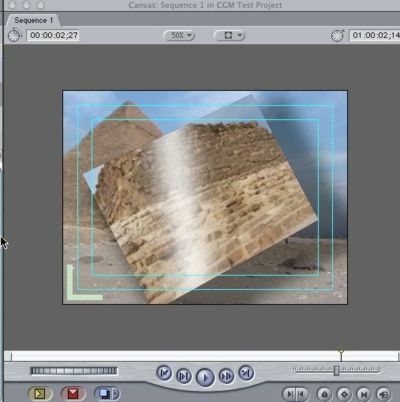 The result is that infamous clamping which we thought we bid farewell with the advent of FCP 2. Finally, they are altivec and multiprocessor aware. There is one small caveat, however, buried in the downloadable "workshops" which serve as the product documentation. When using softwipes (his terminology for gradient wipes), the developer advises setting the sequence to white rather than superwhite in order to avoid luminance shifts in the final rendered output. 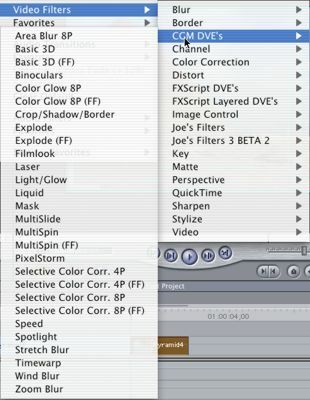 When I first had the opportunity to review Vol 1 of the CGM Filters and Transitions (you know, the one's that Apple now gives you free with FCP 3), I noted the expanded parameters for each filter and transition beyond the comparable Apple plug-ins. That tradition of maximum flexibility through numerous settings possibilities continues with CGM Vol. 2. The Dip to Color Dissolve transition allows not only what it's name literally implies (with the ability to set any color for the dip), it also provides a well into which any movie or still image can be dropped. This image then effectively turns the transition into a "dip to image dissolve". Drop another movie or, better yet, a still image there and you create a very interesting dissolve. The Explode transition (also available as a filter) provides a true particles generator . I'll spare you the disturbing graphic image of the Great Pyramid being shattered, but will show you part of the effects window. They are both manual as well as preset particles settings. Experiment with it to find just the type of explosion you are seeking. When used as a filter, all parameters are of course completely key-framable. Here is another example of a useful transition. MovieFX is effectively a gradient wipe transition with the addition of multiple wells for various movie/maps, adjustable gradients should the gradient option be selected, as well as extensive control over shadow, softness and width (not shown in the graphic). So, having applied the transition, using one of the supplied softwipes (gradients) as a movie/map, here's how this transition appears. The Filters range from the fun to the creative to the infinitely-useful. I love the binoculars filter. Adjustments allow for change of size, sharpness, and distance of the illusion. Using this filter, I decided to try a little experiment. 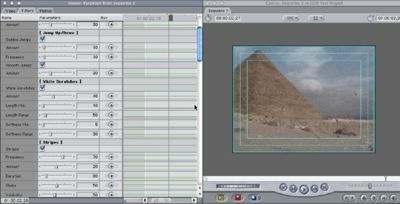 I utilized my clip of the Pyramid as V1 and keyframed over the duration of the clip a scale from 100% to 200%. In V2, I dropped a slug the length of V1. I then applied the binoculars effect to the slug, set alpha for black, and there I had created a simple illusion of zooming through the binoculars. I know one day that will be so useful when asked: "Can you make it look like the explorer is looking through his binoculars at the Great Pyramid and then he, like, zooms in on the Pyramid?" Now, don't just think that this package just contains frivolous filters and all the correct transitions to cut your next cheap furniture store commercial. There are several noteworthy filters, several of which I will illustrate graphically. Selective color correction allows you to create a multiple-point mask and then selectively change a color outside the masked area (or within it, if you choose to invert the mask). Note the lovely green Vulcan sky over the Great Pyramid (and you didn't think the ancient Vulcans built pyramids). 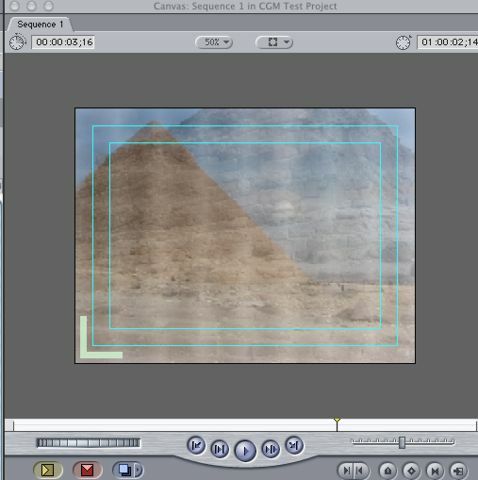 While Apple has built a similar functionality into the FCP 3 color correction filters, the CGM variant allows for much simpler selective masking. Built on a very similar concept to selective color correction, Light/Glow, Color Glow, Area Blur and Wind Blur also allow point-based masking and application of effects. Note here an effect created with the Color Glow filter. Filmlook adds grain, hair, desaturation and a host of other film look features. Again, there are so many parameters to this filter that you can create just about any effect you desire. 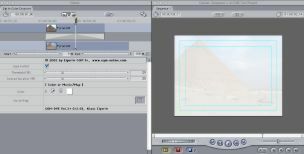 The 3D Zoom Filter (which can also be used as a transition) works as well as higher-priced DVE plug-ins. Just look at some of the parameters as well as a sample of one simple effect. There's only one word-impressive. Now it's time to look at the bottom line. Should you buy the CGM filters? If native FCP filters and transitions are adequate for your use or if you primarily just do straight cuts, then you should save your money. If you are looking for additional transitions and for filters which add both major as well as cute functionalities, the CGM filters represent an excellent value. Consider that you also receive numerous gradients and the value of the product increases. Despite the well-known fact that editors do not like to read manuals, I do feel that the product would be improved with stronger description of the various filters and transitions. Yet merely playing with the adjustments might represent a more than adequate substitute for documentation. Like Volume 1 of CGM, Volume 2 is a real winner and a valuable tool for the creative editor. Ned J. Soltz Ned Soltz is passionate about the uses of technology to enhance the creative process. He only wishes that he were more creative. Now that he has a mobile FCP studio on his Powerbook G4, you can catch him on the road at nsoltz@aol.com. This article was originally published at LAFCPUG and is reprinted here with permission.